For Sega System E arcade game, see Transformer. TransBot, known as Astro Flash (アストロフラッシュ) in Japan and Nuclear Creature in Brazil, is a commonly found Sega Master System game first released in 1985. It was one of the first titles to be released on Sega Card, though was later re-released on cartridge. It is a spiritual sequel to the SG-1000 game Orguss. It seemed like things were finally starting to get back together after the Nuclear War of the solar year 2,000. People had emerged from their underground shelters. They built new downs. New forms of transportation. An all new society. But something has gone wrong. DALAUS, an artificial intelligence computer left over from the now defunct regime is creating a dictatorial empire. DALAUS is already gaining control of one city - and it's rumoured that many of the guards are actually working for DALAUS. The only thing that can stop this treacherous takeover is the new CA-214, a sophisticated transforming combat astro-plane. And the only one who can pilot this high-performance machine is you. You'll have to destroy the enemy's ARM CARRIER. Then try to find DALAUS's hidden fortress and destroy ELGRAMZON to rid the earth of evil influence forever. 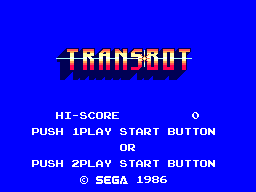 In TransBot, the player pilots a CA-214 starfighter, which has the ability to transform into a robot through power-up icons. It is a sidescrolling shoot-'em-up with a number of different levels and firing modes. There is only one power-up in the game; the "Arm Capsule", which if collected (after shooting a ground-based "Arm Carrier") will cycle through seven modes (labeled A to G) until the user tells it to stop. This means the player has very little control over his/her firing method, however the powerup must be collected regularly to replenish ammunition. G: Maximises the power of the currently selected weapon. C, E and F are fired in robot mode, making the player a bigger target for enemy fire. The "robot embodiment" of Dalaus, which is the closest TransBot gets to a boss. It is likely based on the AT-ST units from the Star Wars franchise. Arrow Flash may be a sequel to this game due to the similar theme of gameplay and name.